This week’s BEACON Researchers at Work blog post is by MSU graduate student Eli Strauss. Of the 37 extant species of cats, lions (Panthera leo) are the only species in which females live gregariously in groups (Caro 1989, Packer 1986). Most other cats live solitarily, with females only associating regularly with their dependent offspring. By contrast, female lions live in prides of 2-18 (Schaller 1972) individuals, usually all closely related. One or few males defend prides of females and their shared offspring from other males. The prevalence of asociality among felids begs the question: what forces have led to the evolution sociality in lions but none of the other cats? The African lion (Panthera leo) lives communally in prides of 2-18 females (Schaller 1972). Of 37 species of extant cats, the lion is the only species that is truly gregarious. 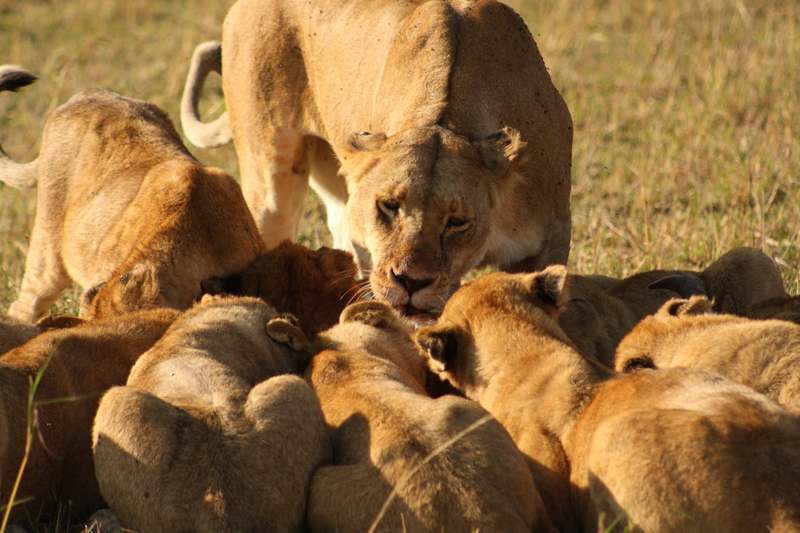 Here, cubs from multiple mothers feed on a kill made by one of the pride’s lioness. Photo taken by Aurelia DeNasha. At first it was proposed that group living in lions evolved in response to selection for cooperative hunting (Schaller 1972). While lions do hunt cooperatively, this hypothesis fell out of favor after Packer (1986) showed that hunting group size doesn’t increase the per capita food intake of the hunting party, suggesting that selection on cooperative hunting is not a strong enough force to lead to group living. As an alternative, Packer (1986) proposed a hypothesis suggesting that a confluence of ecological conditions catalyzed the development of sociality in lions. His hypothesis is as follows. Because lions prefer to hunt large prey, kills produce food sources that are too large to be immediately consumed by a single individual, and are thus likely to persist for several days. Because the African grassland ecosystem has good visibility and supports high densities of individuals, most carcasses will be located and partially consumed by another individual. This means that the original hunter is bound to lose some of its kill to kleptoparisitism, or food stealing. Individuals who live in groups benefit because they lose the food they acquire to kin rather than non-kin, and consequently their loss of food is partially compensated by the indirect benefits of helping kin. In summary, the hypothesis states that large prey size, high population densities, and good visibility produce sociality in large carnivores. Dr. Arend Hintze (from Chris Adami’s lab at MSU) and I are testing Packer’s hypothesis using a simulated population of lions that hunt and reproduce in environments with varying visibility, prey size, and population densities. The lions are encoded as Markov Network Brains (MNBs), which are evolving networks of binary nodes. These networks include input nodes (allowing the lions to detect their environment), output nodes (allowing them to interact with their environment), and hidden nodes, which store information (see http://adamilab.msu.edu/markov-network-brains/ for more information on MNBs). Over the course of rapid evolution, the structure of the MNB evolves, allowing inputs to be linked to outputs in arbitrary ways. As such, the lions evolve the ability to respond to their environment. Lotka-Volterra oscillations of predator (red) and prey (green) populations in our simulated environment. Note that the oscillations are slightly offset. Predator populations are initially large but drop quickly until they learn to hunt and reproduce. Prey populations are maintained at a minimum of 100 to prevent extinction. In our experiment, an environment is seeded with a population of randomly moving prey and naïve lions. The lions begin with a random MNB, and need to learn to hunt for prey. When a prey item is killed it becomes a carcass, and any individual may feed on the carcass until it has been fully consumed. The digital lions reproduce after they have consumed a certain amount of food, and the offspring inherit the parents’ MNB, with some number of mutational changes. Environments are created with different properties (e.g. good visibility vs. bad visibility, large vs. small prey) and we observe whether certain environments lead to kin associating more closely than others. 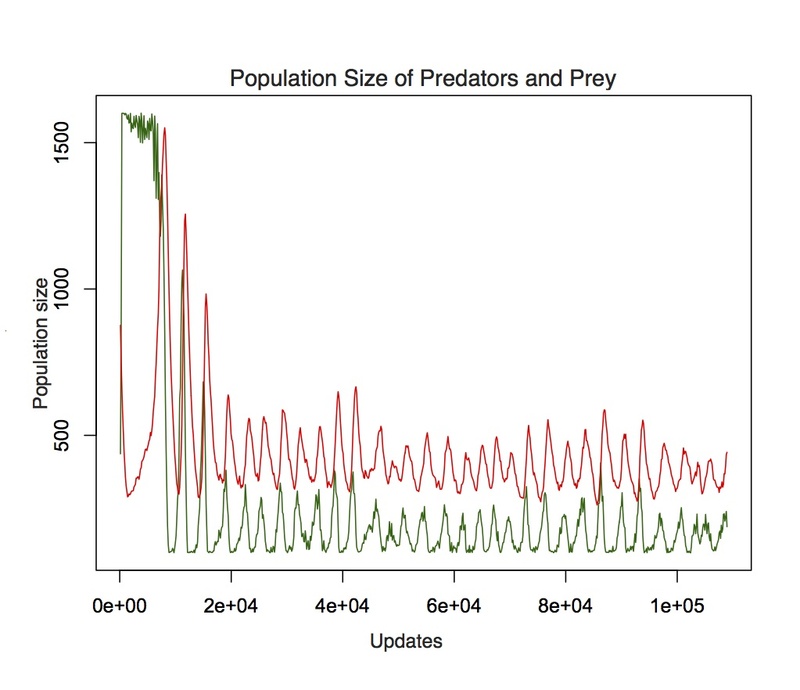 Data collection is ongoing, but thus far we have found that our simulated predator-prey ecology is similar to natural predator-prey ecologies. Populations of simulated lions and their prey undergo localized and global population fluctuations such as those described by the Lotka-Volterra equations, which characterize the linkage between populations of predators and prey. 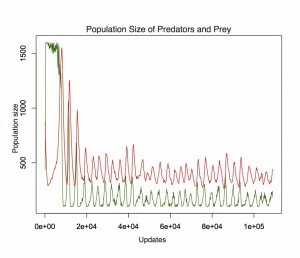 In our experiments, as in the natural world, prey and predator populations undergo similar but slightly offset population size oscillations, where peaks in prey populations are associated with increasing predator populations, and peaks in predator populations are associated with increasing prey populations. It remains be seen whether there are differences in sociality among our experimental treatments. Are the three ecological conditions proposed by Packer sufficient to produce sociality in our simulated lions? Is any one of these conditions alone sufficient to produce sociality? Digital evolution provides a powerful platform for asking evolutionary questions that are difficult to answer with empirical observation alone. Caro, T. M. (1989) “Determinants of asociality in felids.” Comparative socioecology: the behavioral ecology of humans and other mammals Staden V., Foley RA 41-74. Packer, C. (1986) “The ecology of sociality in felids.” Ecological aspects of social evolution 104: 429-451. Schaller, G. B. (1972) The Serengeti Lion: A Study of Predator-prey Relations. University of Chicago Press. For more information about Eli’s work, you can contact him at straussed at gmail dot com.